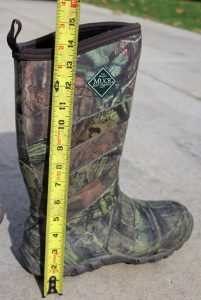 The Pursuit Fieldrunner boots by the Muck Boot Company are water proof “knee high” boots that are ideal for big game hunting in a variety of temperatures and terrains. The boots are constructed of a high quality rubber with a durable Spandura exterior that offers an excellent 4 way stretch for comfort in the field. The outsoles of these boots have a new wide waffle design that is supposed to give excellent traction in mud and snow. The interior of these boots are made of a warm and comfortable 5mm neoprene lined with fleece which deliver comfort and warmth. The build of these boots is impressive, but lets see what we thought of them in the field. These boots look awesome out of the box. The construction is of high quality and the camouflage (Mossy Oak Break Up Infinity) meshes well with the majority of the camouflage patterns I use. 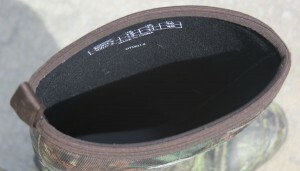 The boot loop is made of a high quality material and allows enough room for a fat gloved finger to fit in. The height of these boots at their lowest point is around 13.75 inches which is plenty high for crossing most creeks and streams. The fit/size is very consistant with other footwear companies. I wear a size 11.5 work boot and a size 12 running shoe so I ordered a size 12 in the Pursuit Fieldrunner. The fit is excellent. When the temperature drops later this year, I will still be able to wear a foot liner and merino wool combo and still have plenty of room. 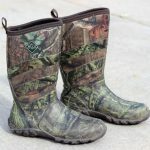 Long story short… These boots are comfortable, hold up to tough terrain, grip well on land and in tree stands, and do not cause blisters after long walks. My first time out with these boots was on a mushroom hunt. Yes the beloved Sheephead Mushrooms (Careens, Hen of the Woods, etc.) were up and in great quantities! My brother and I tackled a large Oak woods that had its fair share of thick patches. As most mushroom hunters know, to find the mushrooms, you have to go through the thick stuff! We did and we ended up with a ton of mushrooms (100+ lbs). I crossed creeks, walked across logs, fought through briars, all while carrying a heavy duffle bag of mushrooms and these boots performed very well. They offered good support, excellent traction, and kept my feet dry. 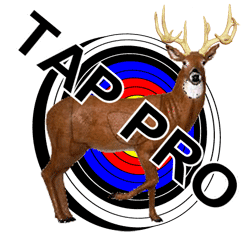 Since my mushroom hunting trip, I have worn the Pursuit Fieldrunner boots every time I have went deer hunting. The temperatures have gotten down into the 30s and I still got by with only one pair of cheap cotton socks. 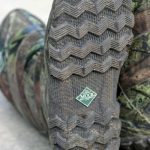 Once the inevitable brand new rubber boot smell fades, boots like the Pursuit Fieldrunner boots are essential if you want to keep your scent dispersal to a minimum. One of my favorite things about boots like the Pursuit Fieldrunners is how you can keep them in your hunting truck, slip off your shoes, slip on your boots and your good to go. You don’t have to worry about any laces or whether your waterproof boots are still going to be waterproof this year. 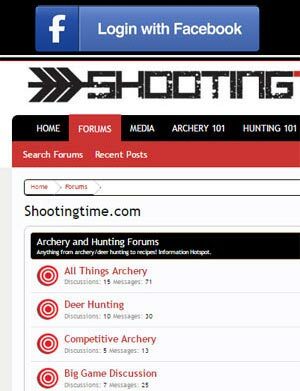 These boots are an excellent choice for any big game hunter period. We give the Pursuit Fieldrunners by the Muck Boot Company a score of 95 out of 100.